BRIGHTON, Mich.- As if it doesn't already seem like the completely redesigned 2013 Ford Fusion has made every list possible, this sedan is getting more praise from Kelley Blue Book! 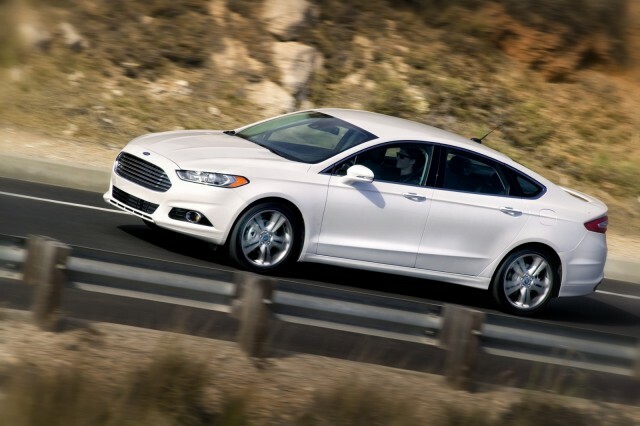 The 2013 Ford Fusion made KBB.com's Best Family Cars List for commitment to providing the consumer with the power of choice. It's no surprise that KBB editors enjoyed this family sedan's eye-catching exterior, but they also noted the variety of powertrains that make this vehicle stand out. With two hybrid options and a pair of turbocharged engines, the 2013 Ford Fusion is the first sedan to offer gasoline, hybrid, and plug-in hybrid powertrains with leading fuel economy. Technology features were not forgotten either. The Fusion was also named one of the best family cars for it's unprecedented suite of driver-assistance and convenience technologies, including sensors, cameras, and radar. Referred to as a traditional family sedan with exotic car design, KBB.com named the Ford Fusion one of the Best Family Cars for 2013! Even if you don't have a family yet, the newest Fusion has so much to offer. Discover more in our 2013 Ford Fusion Brochure, or stop by our Hartland Area Ford Dealership to take one for a test drive. And if you have a vehicle to trade-in, keep in mind that we take KBB Values into consideration at Brighton Ford!